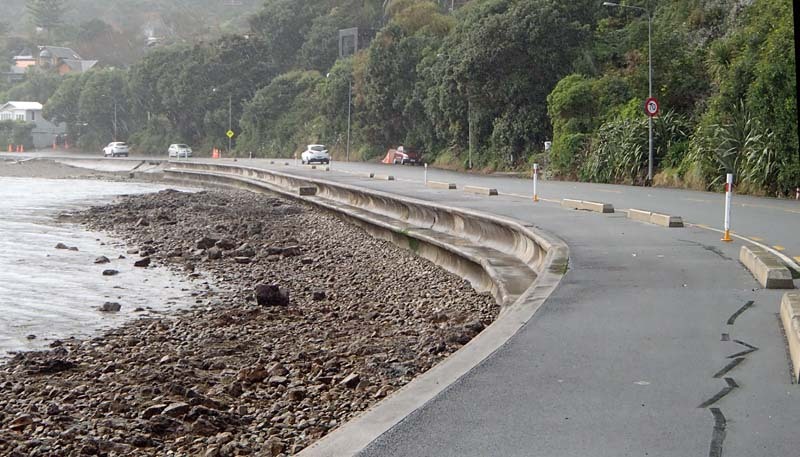 How will the Great Harbour Way/ Te Aranui o Pōneke manage with the sea level rise? Average sea levels are predicted to rise by between 0.2m and 2m by 2100. Much of the GHW is around 0.5m above mean sea level, so this is a natural concern. However the GHW is pretty resilient against sea level rise, and indeed offers resilience to other critical infrastructure. For a significant period, the issue will not be the overall rise in sea level, but the increase in storm events, higher high tides etc. We’re already seeing this, for example with the June 2013 storm that undercut part of the Ngauranga – Petone Rail line. 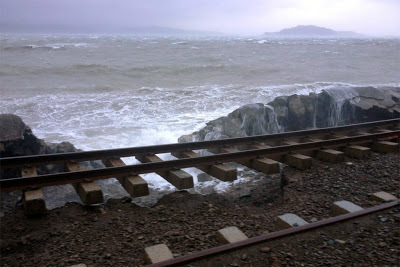 Storm damage to Petone -Ngauranga rail line, June 2013. The planned P2N section of the GHW would have protected the rail line against this. While the GHW is an important active transport route, it’s less critical than road or rail routes. In the storm events that would close sections of the GHW, it’s likely that walkers and bikers will use alternatives or work from home. A cycling/walking route acts as a resilient buffer between waves and road, as already happens on the GHW on Marine Drive between Seaview and Eastbourne. 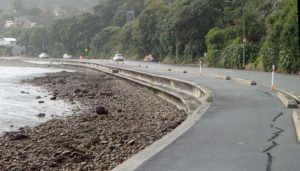 Adding resilience to the strategic Hutt Railway line is an significant benefit of the planned Petone to Ngauranga seaward cycling and walking path. As mean sea level rises (for example if significant Antarctica or Greenland ice sheets melt), it’s likely that the GHW along with other infrastructure will need to be moved or modified – perhaps using floating boardwalks as is used on parts of the Waikato River Trails. But this will be easier than raising roads or rail lines. The GHW, by providing good active transport alternatives, will reduce our fossil fuel emissions to levels that will hold off the worst effects of climate change and sea level rise. WCC has a Low Carbon Capital plan that aims for a 40% reduction in carbon emissions by 2030. Investing in the GHW, particularly by fixing the P2N gap that separates the Hutt from the Wellington CBD, will play a part in achieving that target.